Much of the discussion in this chapter deals with the concept of “true sale”. Provided that the “alchemy” of asset securitisation lies with the bankruptcy-remoteness of trust assets, a true sale is supremely important for the healthy life of a securitisation programme. A number of features that may decide a true sale have been discussed in this chapter. Among them, account standards, including Financial Accounting Standards Board Statements, and a number of court cases, from common law jurisdictions including United States, Canada, and United Kingdom, pertaining to true sale have been taken into consideration. 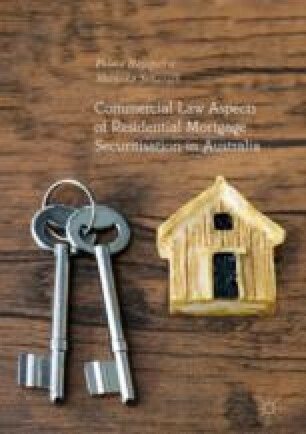 The latter part of the discussion is forced on current Australian regulatory provisions, especially Consumer Credit Code, affecting various aspects of the residential mortgage securitisation in Australia. Senarath, S., ‘The Dodd-Frank Act doesn’t solve the principal-agent problem in asset securitisation’ (2017) blogs.lse.ac.uk (11 November 2018).